Derek Sheils on the Burrows Engineering/RK Racing Suzuki at Kirkistown. Picture: Baylon McCaughey. The new-look Burrows Engineering/RK Racing team wrapped up a successful two-day test at Kirkistown on Tuesday with Derek Sheils and new signing Tom Weeden. Dubliner Sheils took advantage of the dry and mild weather at the County Down circuit to acquaint himself with the new Suzuki GSX-R1000 Superbike, while Kent rider Weeden focused on riding his Yamaha R6 on Monday before switching to his Suzuki Superstock on day two. Dublin rider Derek Sheils got to grips with the new Suzuki GSX-R1000 for the first time at Kirkistown. Picture: Baylon McCaughey. Former Senior Manx Grand Prix winner Weeden is a new face in the team for 2019, taking over from last year’s top Isle of Man TT newcomer Davey Todd, who has moved to pastures new with the Penz13.com BMW team. Weeden sustained a broken collarbone earlier this month following a crash during testing in Spain, but he was able to participate in the Kirkistown test without any major issues as he linked up with the Dungannon team for the first time. “I mainly rode the Yamaha R6 on the first day and then I spent the second day on the 1000 Suzuki,” Weeden said. “I absolutely loved it, although I was a bit cautious at first because I broke my collarbone a few weeks ago when I was testing myself in Spain. Kent's Tom Weeden is a new face in the Burrows Engineering/RK Racing team for 2019. Picture: Baylon McCaughey. “I didn’t think I’d make this test but I got the collarbone plated and I managed to get it set in time to get some more testing done,” he added. Weeden was pleasantly surprised by his initial impressions of the Suzuki GSX-R1000, which he feels compares favourably to the Honda Fireblade he rode previously. “It was my first time here at Kirkistown but I really enjoyed myself and the Suzuki was fantastic,” he said. “Compared to my old Fireblade it was like a different level because it handles like a 600 and has so much power. “It was my first time riding a big bike with traction control as well, which gives you that bit more grip and security, so I couldn’t be happier. “This was the first time I worked with the Burrows team as well, which was a bit of a shock to the system because in the past it was just me and my dad,” Weeden added. “All I had to do was concentrate on riding the bike really, so that is a massive plus for me and I can just get on with it. “We’ve another test at Kirkistown planned and when I’m back over for that, I’ll take a look around the Cookstown and Tandragee courses to brush up on my knowledge. “I just want to go out and enjoy it as much as I can and the internationals like the North West 200, Isle of Man TT and Ulster Grand Prix are the main aim for me. 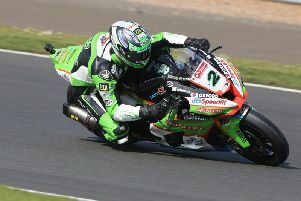 Team boss John Burrows was delighted with the progress made by both riders and said the test went faultlessly. “It was our first time together with both riders and the new bikes, but after two days I’m more than happy and everyone has got settled in,” he said. “The weather was brilliant on both days and Derek could basically ride tomorrow. He got plenty of laps in on the new Suzuki and his times were impressive. “Tom also had a good chance to familiarise himself with the bikes and the team and we’ll take some time when he comes back to Northern Ireland for the next test to drive around the Cookstown and Tandragee courses, to help him build his knowledge.